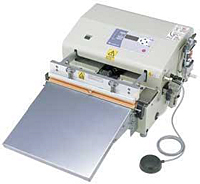 The V-402 is an ideal impulse bag sealer for maintaining freshness for food products, and for preventing oxidation of items such as parts, apparel, chemicals and precision machinery. These heavy duty sealers come standard with the ONPUL feature which allows the user to set and maintain the ideal heating temperature. 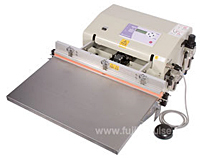 The V-402/602-CH series is a heavy-duty vacuum sealer that is ideal for maintaining freshness, and for preventing the oxidation of parts, apparel, chemicals or precision machinery. The V-402/602-CH series comes standard with ONPUL, the heating temperature control to set and maintain the ideal heating temperature.